Way for members to block specific community members from commenting/answering posts? I've recently had one member in particular who wastes hours of my time asking/commenting about my posts without contributing anything productive towards answering them. I don't want to appear rude to other members (who obviously wouldn't be aware of the history), so I feel obligated to respond to each comment. In addition, I've noticed that once this member starts participating I am significantly less likely to get input from other members (probably because they either assume that he's solving the problem, or because they get as big a headache as I do trying to read through the comments), and I'm therefore not getting questions answered if this member responds to them. I don't believe that it would be appropriate and/or helpful to flag the comments because there's nothing grossly wrong with a comment when viewed individually, and as far as I understand flags don't affect an individuals privileges. Is there anything that I can currently do to limit and/or block this member from commenting/answering my posts, and if not, is this something that would be worthwhile considering in the future? There isn't a way to block a specific user. 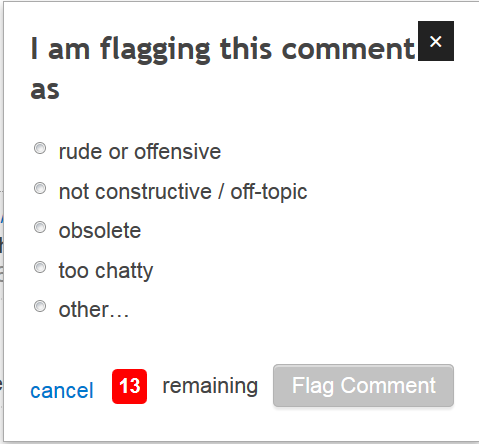 If the pattern of behavior constitutes inappropriate harassment, you should flag the comment or answer for moderator attention (perhaps drawing attention to the user's past behavior in a custom flag). But if it's simply incorrect or unhelpful, just ignore them. (If they provide an answer that is incorrect or unhelpful, as opposed to a comment, you can downvote it). You seem to be worried that not answering the questions will make you appear rude to other users. The question in that case is whether the user's comments, regardless of their source, are worth responding to. If they are, you should be answering them anyway- it doesn't matter who asked them. If they're not, other users will recognize this and won't judge you for ignoring them. As described in the comments, if you have accumulated a long and unhelpful comment thread, you can also flag your post with a custom flag and ask for the comments to be cleaned up by a moderator. Moderators are often happy to clean up long conversations in comments, and it would not lead to any penalty or even notification for the commenters. Flags are not only for offensive content. The one you are looking for is too chatty or other if you can explain why. Either that or you ignore them but I think these are your two only options. Is it possible to add an “ignore” option and block any user from commenting on our answers? Is there a way to block notifications from a particuar post?